A fun foray into the Valiant Universe with Faith at the lead. 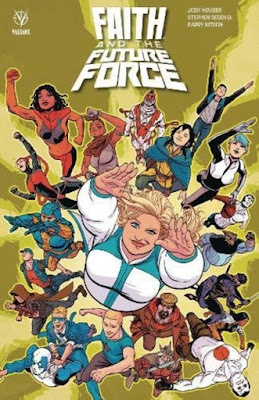 I've only dipped my toe into Valiant's world so didn't know many of the numerous heroes who make cameos in this story. I still found it fun, though, but think that regular readers will get an extra thrill from seeing the familiar faces and understanding the references. This is a groundhog day for Faith as she's called upon by a Timewalker to help save the universe and reality itself. Things keep going wrong, then starting over until Faith figures things out. Fun.